This review first appeared in the January 22, 1985 issue of The Daily Aztec. When Toto's last album, "Africa," went gold and won multiple Grammys, everyone began treating them as a serious art group, and hype began building for their next release. 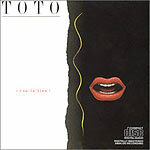 Big mistake  Toto has never been more than a glorified Muzak-maker, and this holds true on their new release. "Isolation" contains no songs worth remembering, and few that will stick in your head. "Carmen" is full of all the little things that make Toto so cloyingly annoying: pretty group choruses; a lead singer with a high, grating voice; simplistic harmonies; and musicianship that is technically perfect but devoid of emotion or humanity. Seven years after their debut album, Toto has yet to show any real musical growth. They keep turning out albums in the same syntho-pop mold. Even the personnel changes in the band haven't helped: Mike Porcaro replaced David Hungate on bass, but who can tell, and Fergie Frederiksen is the new lead singer, replacing Bobby Kimball  but Kimball is by far the better singer. The least offensive song on this album is "Stranger in Town." Pianist David Paitch sings lead on this cut, which starts slow and later builds to a nice chorus. The title track is a mirror image of "Stranger": the verses are driving, while Frederiksen slows the group down for the choruses. Perhaps the members of Toto should quit their rock-star ambitions and go back to what they do best: Backing up those musicians with some real vision.